The recipe for the mosaic cake is not originally Turkish, but like its other European counterpart, créme caramel, the mosaic cake has worked its way into Turkish urban cuisine in the last century. Today, it has become a favorite dessert to end the meal with. 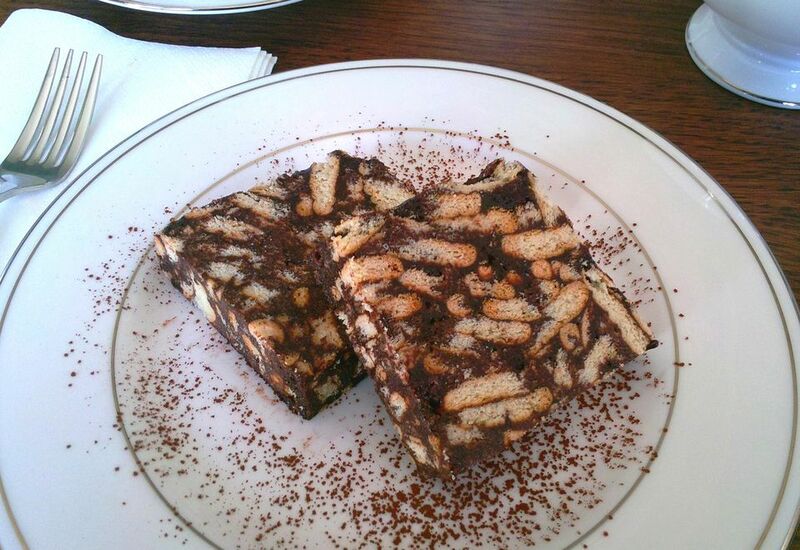 Nearly every Turkish mom makes this easy dessert for her children, and even the most highly acclaimed pastry houses in Istanbul offer a version of it in their shops. It's considered an old standby recipe when you're in a rush, and you can also use it with other ingredients to put together some very fancy desserts. This dessert has everything going for it. It's simple to make and has easy-to-find, inexpensive ingredients. It's also a do-ahead dish that will keep for several days in the refrigerator and doesn't require baking. If you want something rich, chocolatey, buttery, and tender, this cake is for you. No matter how you slice and garnish it, it looks beautiful on the plate. The white biscuits form a mosaic-like pattern inside the chocolate, lending it its name. Plus, it's great for kids parties, entertaining guests, and as part of the simple family meal. You can eat Turkish mosaic cake with coffee and tea, or add other ingredients like dried fruits, nuts, mini marshmallows, and chunks of chocolate to the mix to make a more elaborate cake. Get creative by putting your own spin on it, like making a Rocky Road Mosaic Cake. Serve the dish with chocolate sauce or vanilla ice cream, or slice it thin to make ice cream sandwiches. You can also layer other ingredients like whipped cream and fruit for an extra kick. Alternatively, you can cut it into cubes and use it to dip in chocolate fondue. Next, whisk the sugar, vanilla, and cocoa powder into the butter and chocolate and mix well. Whisk in the eggs and mix well until thickened. In a large mixing bowl, combine the broken biscuits and the chocolate mixture by turning it gently with a wooden spoon until all the crackers come in contact with the chocolate. Line your loaf pan with the clean plastic sheet. Then, fill the pan over the plastic and pack the mixture down as tightly as you can with the back of the spoon. Once all the mixture has been packed down, smooth the top, then close the edges of the plastic over the top. Refrigerate the mosaic cake for several hours or overnight before serving. When the cake is set, unwrap the plastic from one end and begin slicing it. Close the plastic again and keep your cake in the refrigerator for several days.